Earlier in the week I posted about the elegantly quick board game Eight-Minute Empire: Legends I first had a chance to play last weekend at Metropolitan Wargamers in Brooklyn, NY. After a brief, engaging 20 minutes with Legends, I joined four other players in another game that was also new to me and a completely different experience — Advanced Civilization. 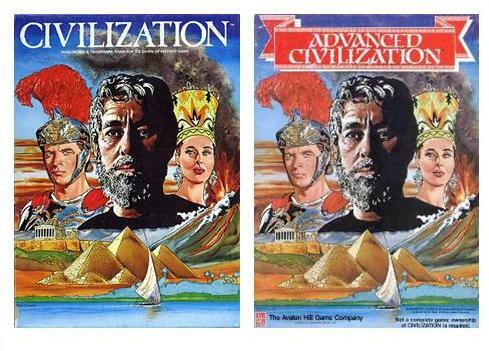 Civilization by UK game designer Francis Tresham was published by Avalon Hill in 1981 and introduced a number of now-standard gaming elements found in many board and video games today. 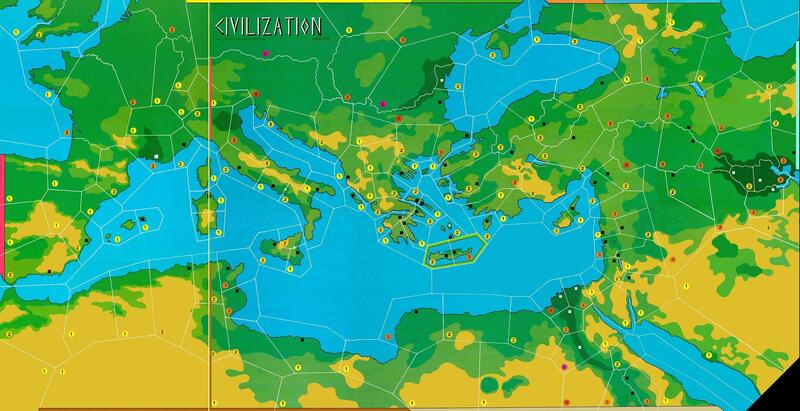 Ten years later, Advanced Civilization offered some refinements, additions and simplifications to the game. Playing with 2-8 players and running to 8, 10, 12 or more rivetingly-complex hours, Civilization has become one of the signature games of the past 40 years. At its core, Civilization is an area control game played in the Mediterranean region in an 8000-year period spanning the Stone Age through the Iron Age. Each player picks a civilization and places a single population marker in a territory in their color-coded beginning edge of the board. Territories each support varying numbers of population, indicated in each area. Population doubles each turn, so one marker grows to two. If the space cannot sustain more than the noted number of population markers, players must move and expand their population to new territories or “starve” population down to the maximum load for the territory. A population census grid on the Archaeology Succession Track (AST) notes population growth of each civilization and determines the order of play the following turn. Moving six population markers to a space with a black square allows the settlement of a city, and twelve may settle a city in a blank space. Establishing cities allows the harvesting of goods the likes of Hides & Ochre, Salt & Timber or Gems & Dye. Drawn in turn order, the stacks of commodities cards also hide calamity cards which have adverse effect on a civilization through such things as Famine, Civil War, Flood or Volcano. Each round includes trading where players must keep certain untradeable calamities while trading away certain goods and other calamities in the quest to collect sets of cards which may then be turned into technologies. The technologies build upon each other through the building of a Technology Tree (“Tech Tree”) which advances with additional abilities and protections for the civilization. Simple beginning technologies like Pottery, Mythology and Music aid early societies but lose importance over time. Philosophy, Democracy, Law, Trade Empire, Advanced Military and Golden Age technologies score the greatest points and advance a society through the Stone, Bronze and Iron Ages to eventual victory. The AST and Tech Tree become the major machines in propelling the game forward, and evolutions of these elements have been incorporated into countless board and video games since their introduction with Civilization. These two innovations make Civilization and other subsequent games like Clash of Cultures focused more largely on elements of managing resources and cultural advancement than traditional combat-focused area control games like Risk. Resource management and building based on collection of resources shows up in so many games, prominently so in the widely-popular Settlers of Catan. Somewhat controversially, the video and board game versions of the Sid Meir’s Civilization franchise owes a great deal both in its mechanics to the Avalon Hill game which preceded it in theme and name. Civilization is incredibly compelling and eerily historic in how it plays and forces the hand of history. Players who begin with small civilizations are forced into territorial expansion through population growth or risk starvation of their people. Once cities thrive, feeding those cities becomes another concern and reason for more expansion. Soon, players find themselves in a loop where development begets expansion begets development. Isolated societies have to begin moving farther afield over land of through developing shipbuilding and sailing technologies. Resources become important to build technologies to further enhance and protect their civilization. By building more cities, more valuable goods are obtained and more advanced technologies may be developed. With all players expanding their societies by mid-game, civilizations eventually must compete for room in the region. 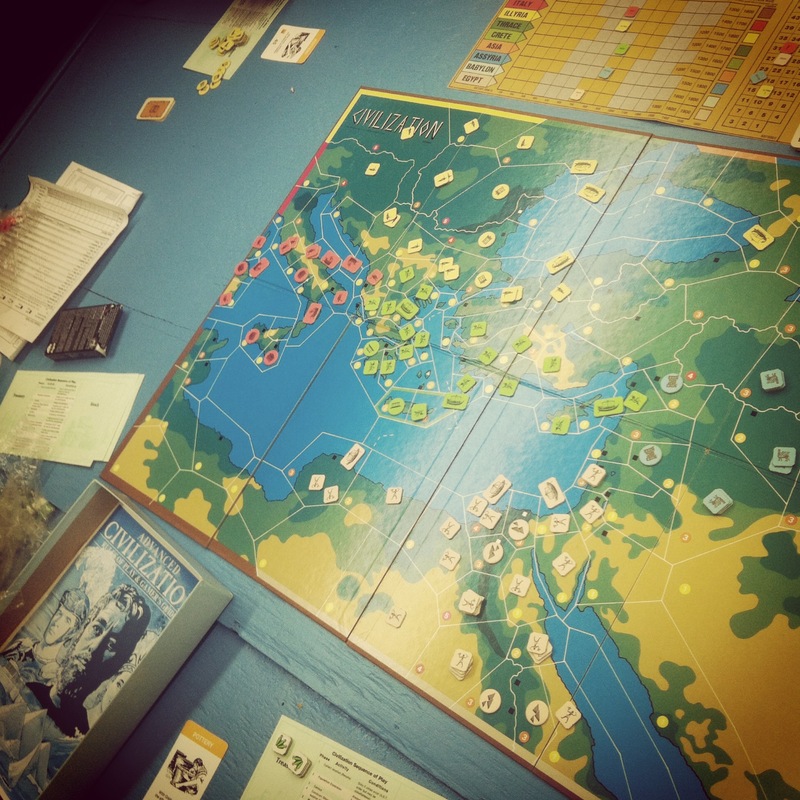 War becomes somewhat inevitable, but diplomacy and mutual-beneficial trade also gain special importance as the game moves on and civilization begin to settle into specific paths to winning the game. Of the hundreds of games I’ve played, I now understand why Civilization holds a special place in the hearts of gamers. Committing to hours upon hours of play becomes a game mechanic unto itself as players of Civilization must maintain focused attention on mentally-exhausting detail. Yes, Civilization is a game, but a marvelously intriguing one to play in the context of our own world where population, space, resources and technologies play out with increasingly dire importance as human civilization marches toward our own eventual historical endgame.